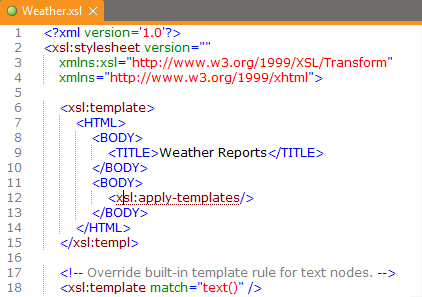 In the XML Editor you write and edit all your documents. XMLBlueprint supports you with context sensitive XML Completion for any valid DTD, Relax NG Schema, Schematron Schema or XML Schema. Document windows are tabbed for easy navigation. An unlimited number of document windows can be opened in XMLBlueprint. 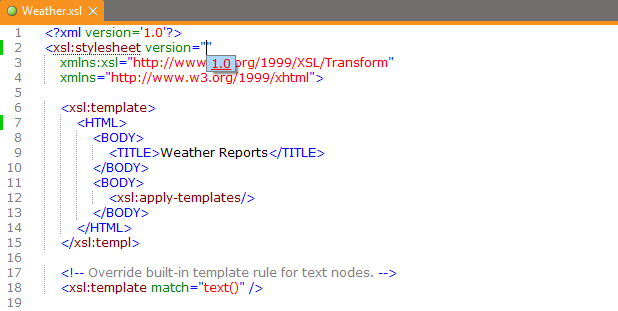 While you edit your XML Document, XMLBlueprint neatly indents your new lines. In the Indentation Pereferences Dialog you can specify the indentation used. XMLBlueprint provides XML Completion ('Code Completion', 'Intellisense') for Element names, Attribute names, Attribute values and Text. See XML Completion? for more information on what to do when you do not get the XML Completion for your own DTD, Relax NG Schema, Schematron Schema or XML Schema. 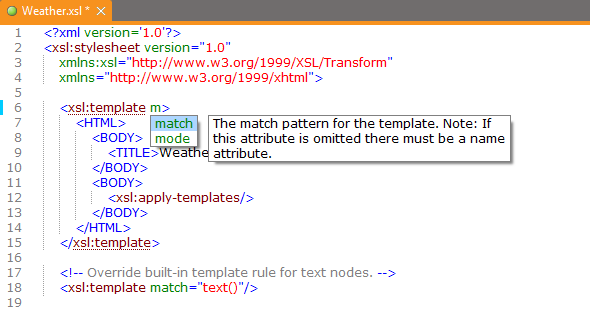 When you enter a "<", XMLBlueprint displays a drop-down list of XML elements in context. • To automatically position the list at the desired element, continue to type the letters of the element name. • Alternatively, use the arrow keys or the mouse to scroll the list. • Enter ":" (colon) to skip the namespace prefix (if present). • To select an element, highlight the desired element and press ENTER or SPACE or TAB to insert. • To close the drop-down list, press ESCAPE. 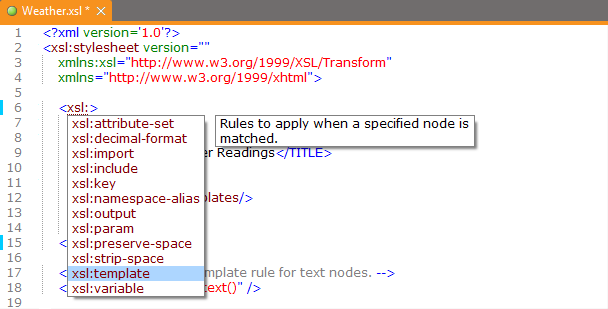 • To reopen the drop-down list, press ESCAPE or CONTROL+SPACE with the cursor within an XML element. When you enter a space (" ") after an element name, or after an attribute value, XMLBlueprint displays a drop-down list of valid attribute names. • To automatically position the list at the desired attribute, continue to type the letters of the attribute name. • Alternatively, use the arrow keys or the mouse to scroll down the list. • To select an attribute name, highlight the desired attribute and press ENTER or SPACE or TAB to insert. • To reopen the drop-down list, press ESCAPE or CONTROL+SPACE. When an attribute has a predefined set of options, XMLBlueprint displays a drop-down list of valid attributes values. • Use the arrow keys or the mouse to scroll down the list. • To select an option, highlight the desired option and press ENTER or SPACE or TAB to insert.